For those wishing for a refreshing change from the normal alcoholic sausage accompaniments Bundaberg have something for everyone. Since trying some Bundaberg Brewed Drinks my wife said to me (of the lemon, lime and bitters flavour) “if they served this in the pub I wouldn’t drink anything else there”. This is surely an accolade. Until you try one of Bundaberg’s fine brewed drinks you won’t believe that it is the finest soft drink I have ever drunk. Unlike almost every other soft drink I have drunk there is no sugar aftertaste. There is a crisp purity about the finish. We tried ginger beer (diet and non-diet), lemon lime & bitters and peach and each drink was faultless. 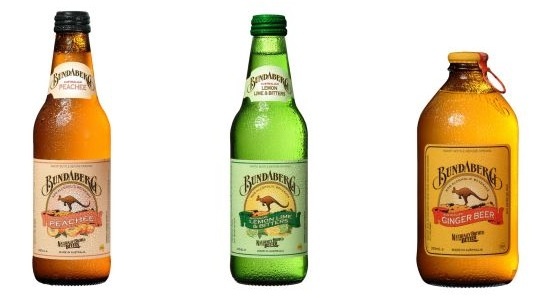 In Bundaberg Brewed drinks we think we have found the perfect accompaniment for any sausage. We tried ours first with Musk’s original and since then we’ve knocked back a bottle or two with most of the sausages we’ve eaten. To our delight these drinks are widely available in supermarkets. For more information call Bundaberg Brewed Drinks UK Ltd on 01484 400990.